the light is all: Guest Photo of the Day: " Golden Colors "
As I've said before, I really appreciate a photographer who can take both landscape and portrait photographs well. Vincent Wo is one of those gifted artists. He has some really nice people pictures--this sensitive pregnancy portrait is one of my favorites--but I couldn't resist showing this beautiful autumn shot. 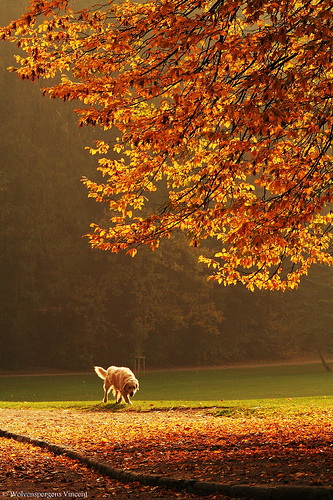 The tree is golden, the leaves on the ground are golden, the dog is golden, even the light is golden. It's one of those images where you can imagine Wo walking across the park thinking, wow, the light's great, I ought to consider photographing that beautiful tree, and then the dog walks into the picture and it all just comes together into a perfectly composed serendipitous moment of pure gold.